Your teacher's name, your name and class, and the year personalised on the front of a handy linked notebook in pink or blue. 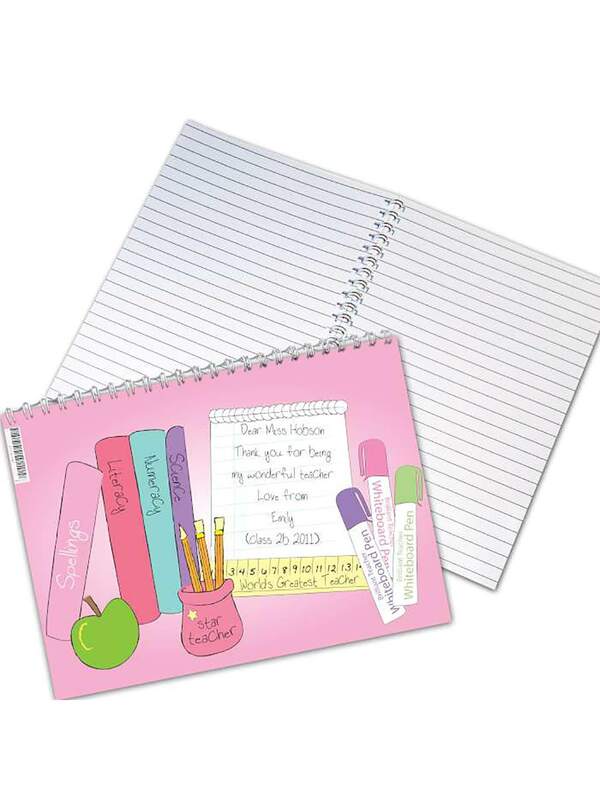 Pink or blue personalised A5 notebook with horizontal cover including 40 lined sheets double sided. Personalise the front of the notebook with the teacher's name (using up to 19 characters), the student's name (using up to 12 characters), the class (using up to 9 characters) and the year (using up to 4 characters). Standard text says 'Dear' and 'Thank you for being my wonderful teacher Love from'. The brackets are also fixed. Dimensions (mm) 21.1cm H x 15.3 cm W x 1 cm deep. 40 sheets of lined paper. Please note that Special Delivery or other tracked services are not available for this product.